Add a touch of nature to outdoor nature themed weddings or bridal showers. 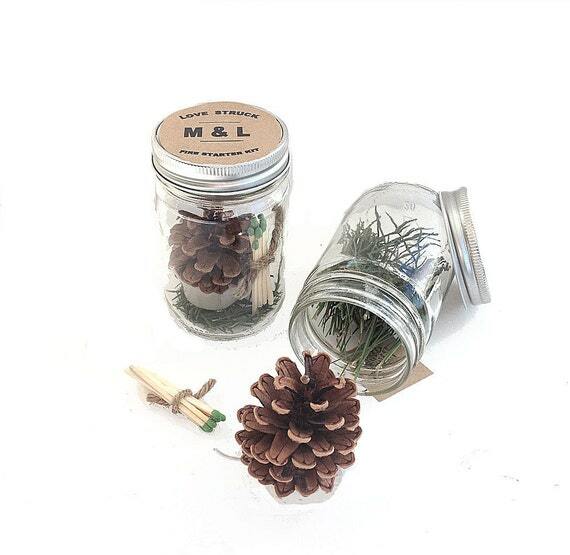 Each 12 ounce clear jar contains a pine cone fire starter, pine needles, bark, pine trimmings, and a bundle of matches to start a fire. Simply place the contents of the jar in a contained area, such as a fire place or outdoor fire pit. Light the wick at the base of the fire starter to fill the room with the natural scent of pine while enjoying a warm fire on a cold winter's night. Browse our store for other nature inspired wedding & party favor ideas. Thanks for shopping by. Feel free to contact us with any questions you might have, we'd love to hear from you! 2016-2017 Nature Favors, all rights reserved.